"How to improve self esteem?" is a topic that many people ask us about. Building healthy self esteem requires taking responsibility for your thoughts, feelings and actions. People with low self esteem often feel they have no choice. They blame others for their circumstances and feel powerless. The truth is you have a choice in how you think, feel and act. Improving self esteem is like developing a muscle. The more you exercise it the stronger it becomes. The muscle in this case is the brain's pathways that support empowered thinking. If you are feeling bad about yourself here are some actions you can take to improve your self esteem. 1. Take a few minutes and read about how the brain works. Improving self esteem requires that you build new brain-pathways. Practice some the activities and exercises on this site. 3. Treat yourself with caring and respect. This means you need to understand how food affects your mood and take time to do things that support loving yourself. Start by completing the Admire Me Worksheet on this site. 4. Join a support group. One of the fastest ways to improve your self esteem is to learn from others. We are social beings - we need others to grow and learn. If you cannot find a local support group, join our internet support group which meets twice a month on Wednesday over the phone. Get live coaching from Joan and Susyn trained counselors and the co-founders of Self Esteem Experts. 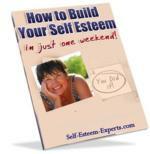 Learn more about how to improve self esteem by reading other articles on this site. Copyright 2009-13 Self-Esteem-Experts.com All Rights Reserved. 415 244.9153 Build a Traffic Generating Website - Use Solo Build It!